This book tells the story of longevity, the time each of us has been given to live our lives. No one can predict the years they have been allotted but it is only within the last few decades that most people with access to modern medicine can reasonably expect to survive to reach old age. Already many individuals are living well over 100. Some commentators believe that much longer lives are a possibility. A self-described biomedical gerontologist, Aubrey de Grey, has put his cards on the table and said that the first person to live to be 1,000 years old is alive today. It may sound far-fetched but there are good reasons to believe he just might be right. The human body is an unbelievably complex, dynamic and imperfect organism. Trying to understand fully our biology is an heroic undertaking, and it is even more difficult to obtain proof about the effectiveness of many medical interventions designed to extend life. Dr David Goldhill was Director of Intensive Care at the Royal London, a leading, internationally-renowned teaching hospital in east London, England. His job was to help save lives; now he’s written a fascinating book on how human life may eventually be extended to a previously undreamed-of age. 5.0 out of 5 starsLive longer and prosper! 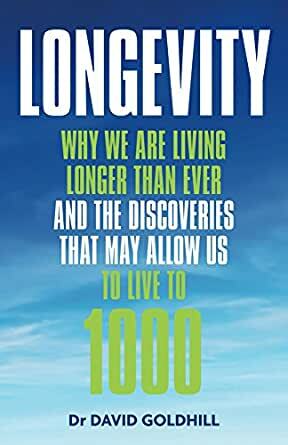 This new book by Dr David Goldhill tells you all you need to know about how and why people can live a very long time. 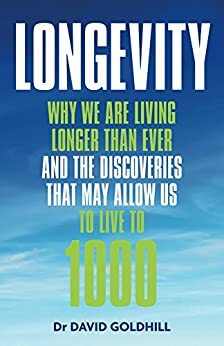 From easily accessible science and medical facts to speculation about living to 1000, Goldhill has come up with the essential study of longevity.